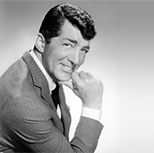 A selection of Dean Martin vocal arrangements for solo vocalist with big band. What charts do we have for you? We only have a few charts to offer you, but will look to add more. "Bye Bye Blackbird", "In the Cool Cool Cool of the Evening", "On the Street Where You Live" and "Ain't That a Kick in the Head".